Do you ever have a nail polish that you covet for months and months (and months) until finally you succumb to its beauty and purchase it? Well, that was me when it came to Rescue Beauty Lounge Will They Won't They. This stunner from Summer 2014's Anatomy of a #KDrama Collection instantly captured my heart and soul -- but it wasn't until recently that I finally took the plunge. Rescue Beauty Lounge's creator, Ji Baek, describes Will They Won't They as "lighter and flirtier than our beloved Insouciant," and I think she's right on the money. Insouciant has long been one of my RBL favorites (just see here and here for proof), so it's really no wonder that I'm just as in love with its paler cousin! Let's talk about that sparkle, shall we? I really think that Ji creates glimmery, shimmery, sparkly polishes like no other. She has a way of making me want every single polish she dreams up! Plus I love when she bakes the shimmer into the polish so the removal is super easy. 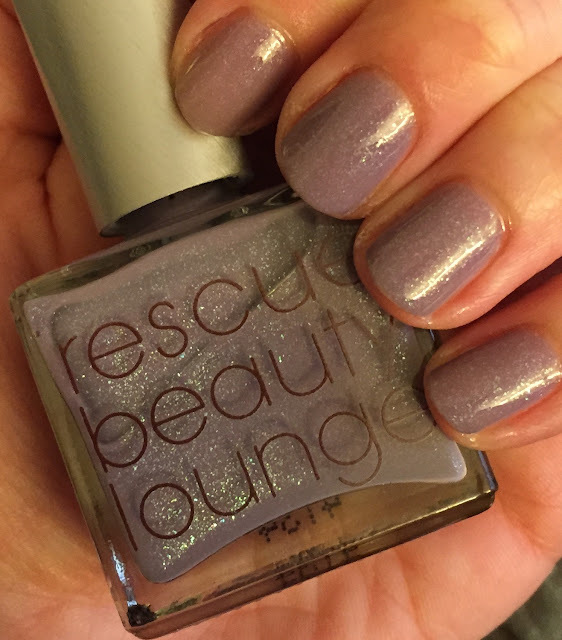 I was lucky enough to snag this shade during RBL's recent 50% off sale, but normally, Rescue Beauty Lounge Will They Won't They retails for $20 at rescuebeauty.com. This is an absolutely stunning shade, and it's gorgeous on you! Amazing shade... RBL is so fabulous! That polish has my name written ALL OVER IT. Such a pretty shade. I don't have many RBL polishes but the ones I have I really like. OMG this is such a beauty of a shade! I've never tried RBL polishes but I've heard great things about them. Love the color combo, I feel it is a good year round shade. Right now I am obsessed with Butter Allure. That's a gorgeous shade and I really like that it can be used year round but versatile for Fall.